Passion is an interesting word. It is usually associated with strong romantic or sexual feelings. The dictionary defines it as strong feelings of enthusiasm or excitement for something or about doing something. The time of our Lord's suffering from the Last Supper to His crucifixion is called The Passion. Our Lord had the deepest love for mankind, and commitment to He Heavenly Father that set His course to willingly suffer, making atonement for all of our sins. Another word is zeal. Which is fervor for a person, cause or object. God is spoken of as having zeal for His people, and a number of individuals in Scripture are referred to as having zeal for the Lord. It is that strong feeling, that fervor, that has driven people throughout the Christian centuries to sacrifice their own time and well being for the good of others, and even to hold their convictions to the point of a martyr's death. It is the knowledge that we are loved with the everlasting love of God that we are willing to do everything necessary to remain in and share that love. A collection of Pastor Stapf's reflections has been published in . . .
by Irvin F. Stapf , Jr.
"'What is your purpose in life?' Do you know where to begin in answering this question? If you are searching for a deeper purpose , Not for This Life Only will give you solid biblical truths to help you discover God's plan for you. This insightful study will establish a firm biblical foundation as you prayerfully seek God's calling for your life. Through all of the circumstances of life, God is seeking to help us grow into Christ's example of sacrificial love. As a topic that can conjure up confusion, discover that God is not silent when it comes to the life he has called you to live. Irvin Stapf has been an ordained Lutheran pastor for thirty-eight years and is the Regional Pastor for the Eastern Region of the American Association of Lutheran Churches. Irvin, and his wife, Audrey, have been married for forty-three years and have five children. They currently reside in Mount Airy, Maryland." 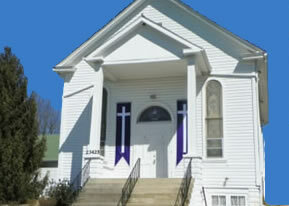 The book is published by Tate Publishing of Mustang,Oklahoma and can be obtained from the author at Christ Lutheran Church, 13903 Legion Court, Mount Airy, MD 21771. The book can also be obtained through major book stores.